Welcome to Ted's cooperative learning and WAC web site and much more. 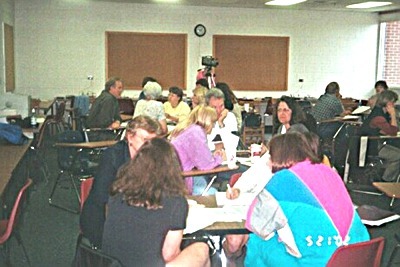 *Everything you always wanted to know about student centered cooperative learning. *The synergy of student centered cooperative learning and writing across the curriculum. *Writing in math courses- what the heck do you write about? *Using cooperative learning techniques for alternative student assessments. Workshops are tailor made for each institution's specific needs or interests based upon the topics listed above.Workshops are generally a minimum of 2 hours in order to incorporate hands on activities and may follow half day, full day formats, or more if desired. Duplication permission If you feel you need it, you have my permission to send this web site to friends and enemies alike. You also have my permission to duplicate these pages, reference them, upload them, download them. If you quote anything please cite my URL as the source and I will be pleased as punch. Also, if you do forward or use this material would you please let me know how. I am curious to see how to my web site is used, if at all. Oh, by the way......................................................................................Have a nice day!!! I hope you enjoy the materials contained in my e-book as much as I have enjoyed assembling them. People from all over the world have participated in discussions about cooperative learning which I initiated on a number of internet discussion groups. These discussions are contained throughout the web site in addition to those listed under the discussions page. This link will take you on a journey through the world of cooperative learning as Ted sees it. Others have though this approach and viewpoint might be helpful to teachers and administrators in understanding the wonderful world of cooperative learning. So believe it or not they actually published some of the things he wrote. Some articles appear as chapters in edited books and others appear as articles in journals and magazines. Click on articles above to arrive at your next destination on the magical cooperative learning tour. Over the years Ted has initiated many discussions about cooperative learning on a dozen or so education internet discussion groups. The responses to his questions and examples have been very gratifying, interesting, and informative. Questions such as "How to you communicate with your students?" or "How does the TAO of teaching apply to your classes?" elicited many great responses. The initial questions and compilation of all the responses are presented for your amusement and to help us all gain some insights into the nature of cooperative learning paradigms. Hopefully you will find many golden nuggets of information or opinions which may stimulate research or further study ideas. If you find something useful for a class feel free to duplicate it (i.e. you have my permission if you need it) and share these pages with your students or colleagues. I will see you again in about 6 months after you have finished reading all this material. Ted's Resume- Who the heck is Ted anyway??? Who does he think he is putting out all this information on cooperative learning? Well...here he is I thought it would be helpful for readers to see my background in print. I hope it gives you a better feeling for why I am so enamored by cooperative learning paradigms and what activities I have been involved in regarding the promotion of cooperative learning in the classroom. If you have something helpful to say about it then e-mail me, if not keep your opinion to yourself!!! Joke file-- I hope you will enjoy these jokes as much as I did. If I offend anyone, I apologize in advance, please let me know and I will consider removing that which offends. Links to other WAC web sites- I have recently updated my listing of WAC web sites. There is a wealth of information out there regarding writing across the curriculum.